Decision support work at the Climate Impacts Group focuses on developing, delivering, and supporting the use of decision-relevant science and technical guidance for managing climate risks. Current and recent decision support projects include the following. The Washington Department of Fish and Wildlife permits and provides technical guidance for construction of hundreds of fish passable culverts, a number which is expected to rise in response to a federal court injunction directing the state to repair thousands of culverts that inhibit salmon migration. This project will support the development of designs that provide connectivity benefits to aquatic organisms throughout the structures’ expected life of up to 100 years by incorporating projected climate-induced changes in hydrology. In response to the Floodplains by Design (FbD) and Puget Sound Natural Resource Alliance (PSNRA) funding opportunities, many communities have proposed projects that address floodplain restoration goals. To date, few such proposals have addressed climate impacts in risk assessments or project design. This project will distill information gathered from in-person interviews, aimed at developing an initial understanding the climate information needed for robust floodplain planning. Recent articles have suggested that the Pacific Northwest, which is projected to have a relatively hospitable climate in the future, will experience an exceptional influx of residents fleeing undesirable or inhospitable climate conditions elsewhere in the country and the globe. This research will present a systematic literature review on climate-related human migration and will illuminate the “push” forces that could drive certain people to move away from their homes under changing climatic conditions as well as the “pull” forces that could draw them to the Pacific Northwest. The Washington State Silver Jackets (WA SJ), is an inter-agency group aimed at coordinating among flood risk management agencies: FEMA, Army Corps, USGS, National Weather Service, and the Washington State Departments of Ecology, Transportation, and Emergency Management Division. Through a series of in-depth interviews with WA SJ members, this study explored ways to better integrate climate change information into flood risk management, with the goal of documenting current practices and identifying opportunities to further integrate climate change in their work. We also evaluated barriers to the use and integration of climate change information in flood risk management, focusing both on technical and research gaps as well as institutional, political, and social barriers. This report describes an assessment of the climate change vulnerability of priority species and habitats for the Nooksack Indian Tribe. In addition to describing our approach and resulting sensitivity scores and vulnerability rankings, we provide an appendix of fact sheets for each of the assessed species and habitat types, highlighting their overall climate vulnerability and primary climate sensitivities . These estimates of climate vulnerability, underlying climate sensitivities, and key information gaps will help lay the foundation for the Tribe’s future climate adaptation and research efforts. Preparation for the impacts of climate change on Washington State Parks has become critical as the agency strives to create and sustain a healthy parks system. State Parks has already experienced many climate related issues which will be exacerbated by climate change. Understanding how climate change may affect State Parks’ properties, facilities, operations, and state-wide programs is critical for ensuring State Parks continued ability to provide “memorable recreational and educational experiences.” The Washington State Parks and Recreation Commission contracted with the University of Washington Climate Impacts Group (CIG) to conduct a climate change vulnerability assessment for State Parks’ properties, facilities, operations, and state-wide programs. Understanding the impacts of climate change on State Parks is a necessary foundation for reducing climate risks, protecting Parks’ investments, and ensuring continued program success. Preparing for and responding to the impacts of climate change are critical to the future well being of tribal communities. Recognizing this, federal, academic, and tribal institutions have increased efforts to promote the capacity of tribes to manage climate change risks. However, many tribes continue to experience difficulty initiating and completing the critical first step of the adaptation planning process: a climate change vulnerability assessment. This project will help address limited tribal capacity for vulnerability assessment by providing guidance and data tailored to the needs and capacities of Northwest and Great Basin tribes. The Stillaguamish Tribe of Indians Natural Resources Climate Change Adaptation Plan completes the next major step in preparing for climate change. Developed by Natural Resources Department staff with support from CIG, the plan identifies 190 actions, organized by habitat type and inclusive of outreach and education, that are expected to help species and habitats important to the Stillaguamish Tribe become more resilient to the impacts of climate change. These actions span a range of activities consistent with the current work of the Natural Resources Department, including planning, restoration, data collection, monitoring, consultation, and outreach and engagement. The plan also includes new activities not currently reflected in the Natural Resources Department’s scope of work that will be needed to meet the plan’s goal and objectives. Partnerships will play a critical role in implementing these activities within the Stillaguamish Watershed and, when relevant, the area ceded by the Tribe under the Treaty of Point Elliot. Climate change is projected to have significant impacts on natural resources utilized by Washington tribes for economic, cultural, and subsistence purposes. To help reduce and prepare for those impacts, the Stillaguamish Tribe contracted with the CIG to assess the vulnerability of key species and habitats for the Tribe. CIG is partnering with GGLO Landscape Architects and SvR Design to assist efforts by the City of Seattle Office of Sustainability and the Environment to develop a comprehensive climate change preparedness strategy for the City of Seattle. The preparedness strategy will include a high level assessment of the vulnerabilities of city assets and services and priority actions for enhancing resilience across a range of city departments. The CIG is partnering with Cascadia Consulting and Yakama Nation tribal staff to support the Yakama Nation’s development of a climate adaptation plan that will guide near term adaptation decisions and outreach as well as long-term strategic planning related to climate adaptation. For many Pacific Northwest rivers and streams, climate change is projected to result in higher peak flows. Recent work by the Washington Department of Fish and Wildlife (WDFW) has estimated the width that culverts need to be to accommodate the anticipated changes in streamflow and to allow for safe fish passage. Part of this project will include a prototype of an interactive tool that allows users to easily browse stream flow changes and the likelihood that a particular culvert size will fail as a result of climate change for specific locations within the Skagit watershed. Natural resource managers face significant challenges when applying stream temperature datasets or projections to climate adaptation efforts. In cooperation with local resource managers, CIG is working with colleagues at USGS to develop a handbook that can be used to guide the selection of appropriate stream temperature data and models for specific management questions. Climate change is projected to exacerbate existing challenges associated with flooding. Flood management decisions made today will have implications for flood risk extending well into the 21st century, and beyond. This means that communities and agencies need to plan for the impacts of climate change now in order to ensure that public resources are used effectively and that local communities are prepared to deal with increasing flood risk associated with a changing climate. Due to the complex multi-stakeholder nature of flood risk management, coordination is essential. The Washington State Silver Jackets (WA SJ), is an inter-agency group aimed at coordinating among flood risk management agencies: FEMA, Army Corps, USGS, National Weather Service, and the Washington State Departments of Ecology, Transportation, and Emergency Management Division. Through a series of in-depth interviews with WA SJ members, this study explored ways to better integrate climate change information into flood risk management, with the goal of documenting current practices and identifying opportunities to further integrate climate change in their work. We also evaluated barriers to the use and integration of climate change information in flood risk management, focusing both on technical and research gaps as well as institutional, political, and social barriers. This project builds on existing approaches to adaptation planning and surveys of U.S. Forest Service aquatic habitat managers and scientists in the Pacific Northwest to develop a resource-specific guide for: 1) synthesizing information about climate impacts to assess the sensitivity of aquatic habitats to climate change, 2) evaluating the resource’s climate change-related adaptive capacity, 3) identifying priority planning areas, goals and actions related to preparing for climate change, and 4) developing measures of resilience to track progress and update plans over time. The Time of Emergence (ToE) project aims to develop and implement a new approach to climate change decision support based on the concept of identifying the time at which the distinctive trend due to climate change is projected to emerge from the noise of natural climate variability. 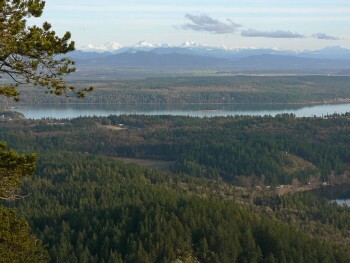 Through a combination of climate statistics, engagement with policy and management entities, and data delivery platform development, researchers aim to develop a new approach to climate change decision support based on the concept of ToE for the Puget Sound basin in the Pacific Northwest (PNW).